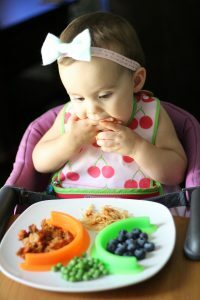 Does your child like their food separated? Is it hard for you to bring a special sectioned plate everywhere you go? I have found an easy peasy way to deal with these issues! 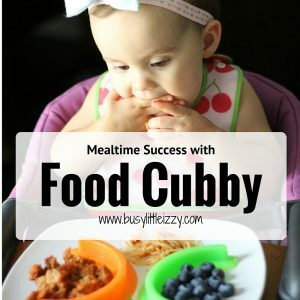 With Food Cubby you will be able to separate food on a plate at home or in a restaurant. They are so easy to throw into a diaper bag and wipe down. I love these and think they would be perfect for all ages of children. 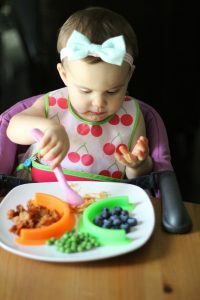 This product is BPA free, food grade silicone. They easily suction onto the plate allowing for an instant sectioned plate. 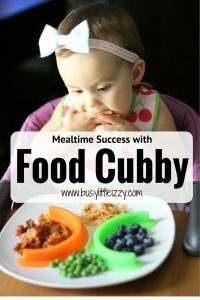 Izzy loves her Food Cubbies and so do I, I’m seriously urging you to take a look into this awesome mealtime product! You can purchase yours here. It’s just my opinion, however I feel you should get the 4 pack so you have 2 for home and 2 for travel. Check them out and let me know if you like them as much as me! We love our Food Cubbies!! I’m not gonna lie my husband and I fight over them too. Definitely get the 4pk! Loving the food & eating tips from you lately!!! I just LOVE this! 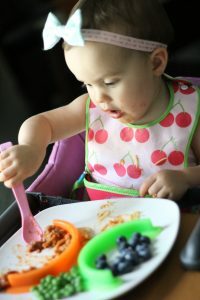 And I love how Izzy seems to be such a great eater! Yay for mealtime! What a brilliant idea! I need to get some of these! I will definitely be using them for myself!